The realization that his humiliation had bought him was that religion is just a refined brand of hedonism. Becoming habituated to the magnificence and wonder of the gospel is the most irrevocable form of lostness. I located the passages in TPATG that dealt with ‘the habit of piety’ relatively easily after I was done with the book…because next to each of them I had scrawled the word ‘Keller’. 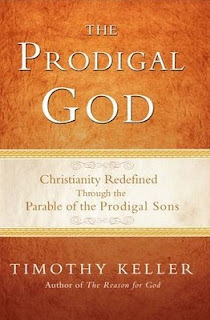 These passages dramatically illustrate the very idea that Tim Keller argues is at the heart of the message of Jesus and, in particular, the story of the prodigal sons. This is the startling uniqueness of the gospel. It is not a program of moral reclamation. It is not a method to turn bad people into good people. It is not the transformation of reckless hedonists into intolerable, self righteous prudes. It is a unilateral acquittal that seduces us into better passions. It is a prodigal (recklessly extravagant) affection that subversively supplants our self destructive loyalties to self interested masters. 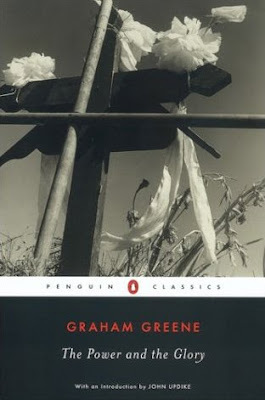 Greene’s work has such resonance because to claim Christ is to be a ‘whisky priest’: a tired, helpless, moral failure, whose rare heroism oozes with mixed motives, but whose passions are rehabilitated by God’s prodigal love in the midst of our lostness. Green is best known for The Quiet American which was made into a descent film with Michael Cane. 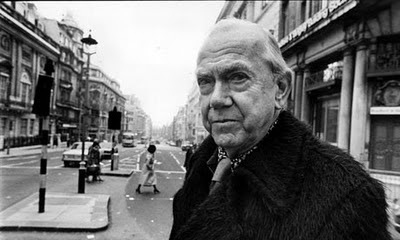 In the middle of his career he wrote three novels that have come to be known as his ‘Catholic period’ after his surprising conversion. The Power and the Glory is one of these and is set in an oppressive, violent, anti-religious communist state in Central America. It is a novel with a tactile sense of place since Green spent an extended period in a similar communist state researching a non-fiction expose on religious persecution. I speculated that it is the difference between the quintessential modern (Flaubert is considered father of Realism) and a child of postmodernism. We also speculated that Dan preferred Flaubert and I preferred Greene because Dan is more of a modern and I am more formed by the latter perspective. Literally ‘the work works.’ This idea emerged from the Donatist controversy in North Africa. The question was, do sacraments administered by heretic or morally compromised priests ‘count’. 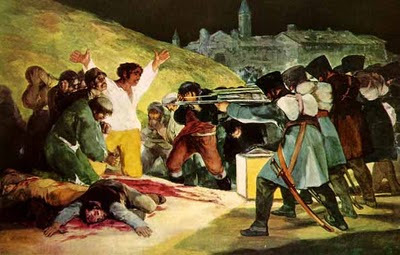 The church decided, ‘yes.’ This is the sublime madness he is playing with when the whisky priest argues with the communist Lieutenant “I can put God into a man’s mouth just the same – and I can give him God’s pardon. It wouldn’t make any difference to that if every priest in the Church was like me” or in the torment of the married Father Jose “But then he remembered the gift he had been given which no one could take away. That was what made him worthy of damnation – the power he still had of turning the wafer into the flesh and blood of God. He was a sacrilege.” Greene seems to argue that this is the advantage of Christianity over communism. The later requires extraordinarily righteous and uncompromisingly selfless leaders to ‘succeeded’ while the Church’ success is independent of the moral quality of its leadership. (I couldn’t help wanting to mail this book to all of my Catholic friends as I feel it speaks peace to their movement in the midst of the horror of the abuse scandal they are broken-heartedly weathering). “But I’m a good woman, father,’ she squeaked with astonishment. “I love God father,” she said haughtily. He took a quick look at her in the light of the candle burning on the floor – the hard old raisin eyes under the black shawl – another of the pious – like himself. ‘How do you know? Loving God isn’t any different from loving a man – or a child. It’s wanting to be with Him, to be near Him.’ He made a hopeless gesture with his hands, ‘It is wanting to protect him from yourself.” 173 “That was another mystery: it sometimes seemed to him that venial sins – impatience, and unimportant lie, pride, a neglected opportunity – cut you off from grace more completely than the worst sin of all. Then, in all his innocence, he had felt no love for anyone; now in his corruption he had learnt…” 139 In some ways, Keller is the bizarro-Lewis (who often held that he was a far better writer than speaker). He may be the best Christian orator of our day which makes his writing disappointing in comparison despite its exceptionally high quality. I unpack how these themes are also the themes of the parable of the Pharisee and the Tax Collector in my talk on Luke 18. Green beer can be fun, but on the whole St Patrick’s day generally leaves me nonplused. I’m sure there is a ‘true meaning’ of St Patrick’s day, but I am so sick of that old ax that I have no interest in grinding through March in addition to December and April. But today included two fun leprechaun ‘sightings,’ that I thought worth sharing. I took an ecology final this morning in Storer Hall, home to the department of Evolution and Ecology. 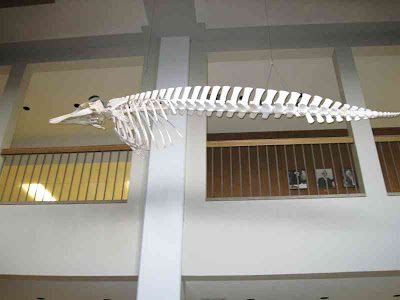 The first thing you notice, when you walk into this building, is a large porpoise skeleton suspended from the ceiling. Ah, the musty eccentricities that pass for academic décor. 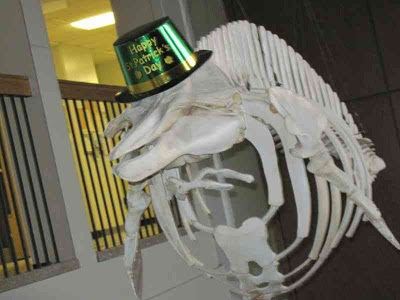 But this morning, a festive prankster had included the inaccessible, expired, marine mammal in the festivities. Props to the stealth pranksters for forgoing the obvious holiday for skeleton involvement in favor of one far less cliche. Then, this evening, my reading group began our trek through volume 2 of NT Wright’s epic New Testament series: Jesus and the Victory of God. The first 60 pages had some fun moments but none were more entertaining than his description of Dominic Crossan: “(Crossan) has been described by one recent friendly critic as a ‘rather skeptical New Testament professor with the soul of a leprechaun.’” The description is as apt as it is timely. Mainly because I don’t think I’ll get another post off before I leave for central Asia but I hope to post a travel blog when I return. The new geology building got a saber tooth. Affectionately known to us as J-VOG. 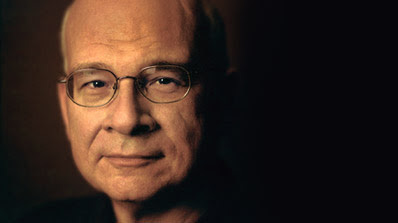 He retells the story of the prodigal and casts the theologian as the older brother and the historian as the profligate suggesting that mature, robust, historical analysis (after a protracted period of polemical, ideological, antagonism) finally returns home with insights to offer the theologian, but the latter is too smug in his fidelity to receive it. This comment comes in the midst of an introduction to Crossan’s work that is effusive with praise including comments like ‘(Crossan) seems incapable…of thinking a boring thought or writing a dull paragraph’ and ‘Crossan represents…the high point of achievement in the new wave of the New Quest.’ Which makes the next sentence especially startling: “It is all the more frustrating, therefore, to have to conclude that (his) book is almost entirely wrong.” It is clear that Wright has a great deal of respect and affection for Crossan personally, but his analysis of Crossan’s work as tautological and thoroughly misguided is, in my opinion, 100% correct. I have often thought that if I was an actuary, I would create an automotive insurance variable called ‘the road cut’ factor. I would simply ask, ‘Have you had more than one geology class?’ If the answer is yes, I would increase their rate. You see, I believe that geologists are fundamentally bad drivers because where other people just see rock next to the road, we see an unfolding narrative…clues to a great regional mystery…artifacts of a an sublimely distant history caught unaware; exposed by the indignity of dynamite from their multi-million year hiding place. 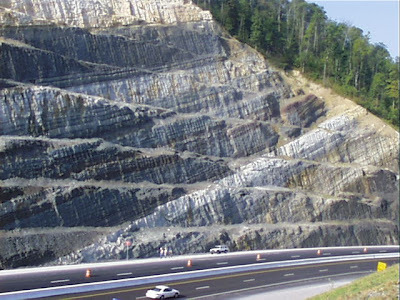 Road cuts are the equivalent of a modest young woman revealing a little more leg than usual in a moment of careful carelessness. Settlers of Catan is my favorite board game for a number of reasons…but one is a little eccentric. After the board has been laid, I try to reconstruct the geologic history that would result in the physical geography (mountains, deserts, moisture and soil distribution) of the island that did not exist minutes earlier. Are the mountains volcanic or mélange? Why do trees grow on the east while sheep friendly grasslands dominate the west? Does the desert make sense as a rain shadow of the mountains? And when the ‘gold’ expansion pack is used, I rack my brain to understand how mineral rich placer deposits formed. 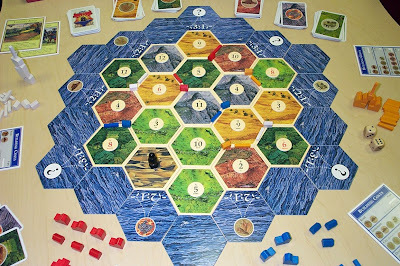 This is problematic because Settlers is won or lost in the first 10 minutes when you place your initial settlements, and I am invest precious mental resources trying to understand how the fictional world came to be rather than focusing on how to victoriously exploit it. The earth is dynamic, and I can not think of any reason why a renewed earth wouldn’t be dynamic. The great city(s) of the renewed earth, would presumably be built in locations such that the earth’s natural rearrangements and perturbations would not translate into human disaster. 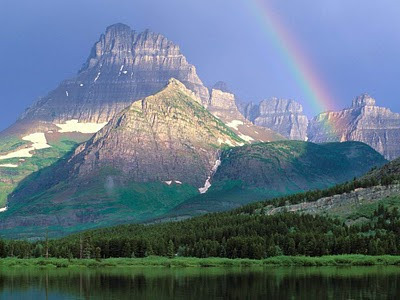 But it would also mean that the new earth would continue to reveal new glories indefinitely. 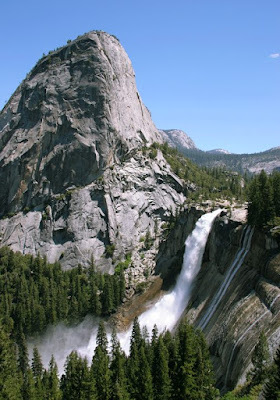 Yosemite and Glacier would eventually erode into unremarkable monuments to the inevitability of gravity and entropy. But an eternal, dynamic earth would continue to perform endless variations of geologic virtuosity. Only by recognizing how many Yosemities there have been can we contemplate how many are yet to be. Passing eons would bring new wonders and creations which, like their Creator could be indefinitely enjoyed not as a static perfection but as an eternal dance of discovery and wonder. Of course, if I was an actuary, I would also include a risk variable for actuaries for throwing themselves in front of busses because their job is so dull. Though, to be fair, I have been studying a fair bit of actuarial theory lately since it is the foundation of Ecological Population Modeling. Many of the original break throughs in Population Biology were made by NY insurance magnates who dabbled in Natural History on the side. Pun intended…if someone makes a pun and no one realizes it…did it happen? I find the natural science education pitched as a new way of seeing delightfully and subversively similar to the theology of Christian conversion, both theoretically and empirically. I am not a trecky. This is the first Trek film I have seen. My family watched Next Generation during dinner on Sundays during most of my adolescence, so I get the premise, but have almost no attachment to any of the character from the original series. Still, I appreciate the effort taken to find continuity with the original narrative despite consciously re-writing the it. (That’s right, I’m calling you out Batman and Spiderman). We enjoyed the film. But it had some glaring faults. Kirk and Spock senior’s meeting was far too coincidental, I had trouble buying Syler as Spock, and the whole thing had kind of a Space Camp feel to it (with essentially undergrads rising to positions of prominence to form the Enterprise crew). Although one could deduce that JJ recognized that this would be a tectonically unstable configuration and thus, why the Romulan villain (who was a miner and, presumably, geologically savy) chose to drill to the core at this particular site. This theory is corroborated by the fact that when Nero (who Banda hit out of the park) attacked earth, he drilled in the SF bay which the average viewer would recognize as techonically active. 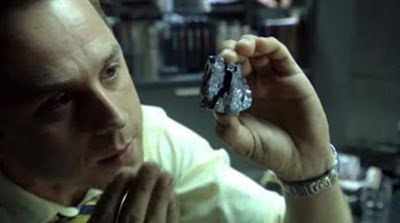 In a film that gave such careful effort to imagining a biological system (if taking an unintentional stand on niche ecology and convergent evolution…more on this in a later post) their geologic imagination was on par with that expended on the story and dialogue. Though, the text is so clear on this, ‘misread’ is generous. Really, this is medieval theological baggage happily leveraged by dispensationalism. That’s right, I’m looking at you ‘Left Behind’ truther. I made this phrase up. In the church we often talk about if someone is ‘theologically trained.’ In music we talk about someone who is ‘classically trained.’ Being ‘geologically trained’ seems like it should be something too. One of the things that I find interesting about Biblical eschatology is that it is fundamentally urban. But that makes sense. If the new earth is to sustain an enormous population indefinitely, population will have to be concentrated so resources can be harvested sustainably. Concentrating population minimizes anthropogenic impacts on creation. Eschatological cities would be centers of creativity and would not suffer the ill effects of the endemic nature, so urban life will not be plagued with the ills that are currently associated with it. But, by concentrating habitation and environmental impact in one or a few urban centers, the new earth would presumably be mostly natural and, I suspect, regularly visited in a ‘leave no trace’ practice of redeemed enjoyment. credit, the ever quotable Capadocian Fathers.